Table of Contents Next: Helfrich, Conrad E.L.
Heito (Pingtung; 120.475E 22.665N) was the location of an airfield complex in southern Formosa used by Japanese Army fighters and reconnaissance aircraft in their assault on the Philippine Islands. At the time war broke out, 24 Air Regiment (36 Ki-27 Nate) and 5 Air Division (13 Ki-51 Sonia, 10 Ki-36 Ida, 9 Ki-15 Babs, and 2 Ki-46 Dinah) were based at the airfield. 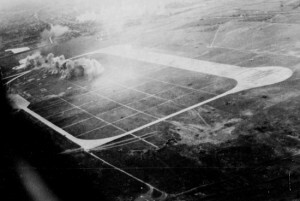 The complex came under Allied air attack beginning on 11 January 1945 and continuing with growing intensity to the end of the war.